Friday 9 Dec Tammay had the whole day off work whereas I had to made do with a half day. After a horrifically long taxi ride to the airport, we checked in and settled down in the Concorde Lounge. A 3 course lunch and a massage at the spa quickly got us in the holiday spirit. 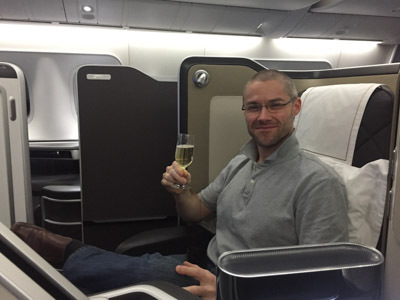 We had once again used some of our Avios points to fly first class. The cabin of the 787 Dreamliner was very nice. Saturday 10, the overnight flight got us into Kuala Lumpur at 15:20. We had to transfer from terminal 1 to 2 (KLIA2) in order to reach the Tune Hotel where we would be spending the evening. Tammay had described it as a 'Malaysian Travelodge' but even that was overstating it somewhat! It was a serious step change from our experience in BA first class, but it was just a short walk from the terminal, so would be very convenient for our 07:00 flight to Phuket the following morning. After lots of issues with the ticket machines at the KLIA2 train station, we were on our way into the centre of Kuala Lumpur, which I hadn't visited in 13 years. We wondered around the KLCC mall making sure to find a Starbucks and call in at Sincere Watches were I'd bought my first Tag Heuer during my last visit. 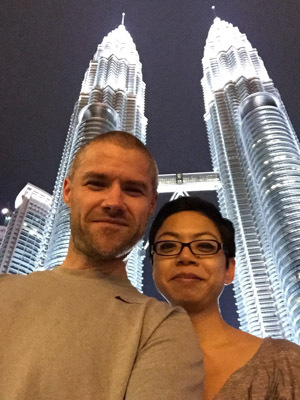 After dinner in the food court we walked to the front of the Petronas Towers and took a few photos. We took a taxi back to our hotel. I could barely keep my eyes open! Sunday 11, our budget flight with Air Asia from Kuala Lumpur to Phuket (Thailand) worked out well. We were first to board, sat in the first row with a spare seat and were also first off the flight when we landed. If only all flights could be like that!